Posted on March 24, 2019 by David M.
Last Wednesday was a great contrast to the wild day that followed on Friday, as the sky was clear and the wind was nil when Dave Weaver and I led WMB to Plum Island. On our way to the north end, along Plum Island Turnpike, we were happy to see three FOY Killdeer flash across the road. We looked forward to enjoying the beach at the river’s outlet in the relatively calm conditions. But we were unprepared for how “pluperfect” it was, to use the term Dave Weaver came up with for his Massbird report. It was stunning to see the river surface glassy in all directions, lit by bright sun and roiled only by current in the silent air, with rafts of birds arranged all around. Right off the beach, we were struck right away by the sight of a Red-necked Grebe, almost entirely molted into beautiful alternate plumage. 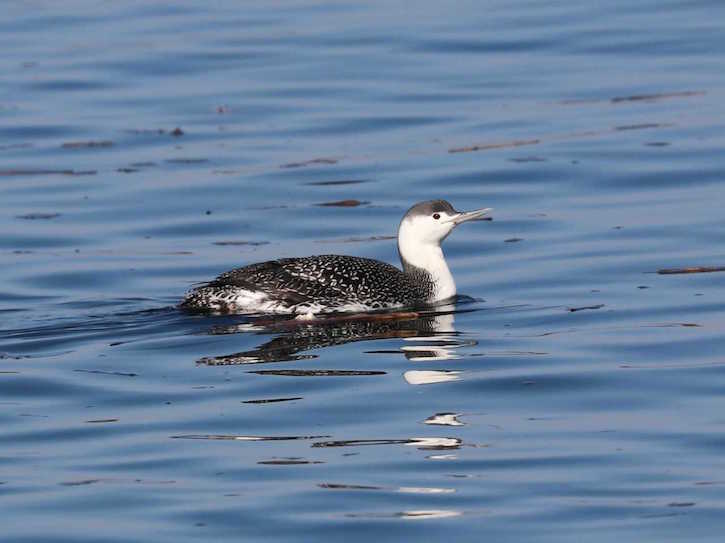 That special bird was joined eventually by three Red-throated Loons, who came right up to the beach, as if to make up for all the views of that species we missed this winter. 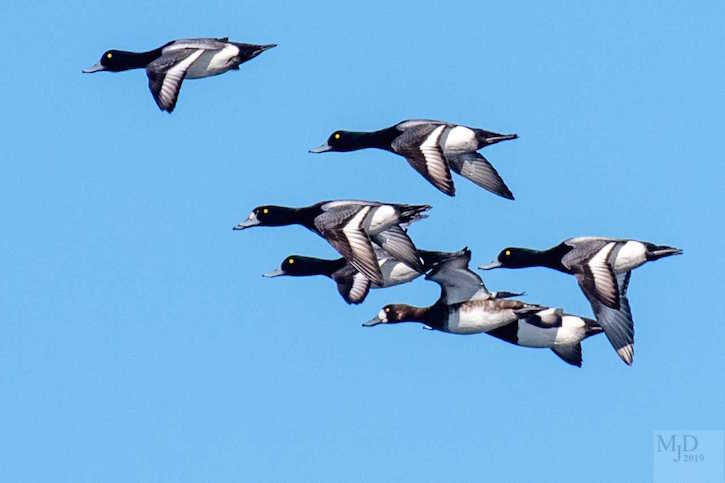 Common Eiders, Black and White-winged Scoters, and Long-tailed Ducks rode the strong current , foraging on the purported mussel beds at intermittent spots as they floated along. Common Goldeneyes enjoyed the relatively still waters to the left of the boat docks, and after a while John Cannizzo spotted an adult Bald Eagle standing on a log in the marsh across from the boat ramp, at Salisbury Beach SR. That bird took off to tussle in the air with an immature eagle, giving us a fantastic show. The list up there was rounded out with some Red-breasted Mergansers, and the song of a House Finch, reminding us that we were about to cross the line of the equinox. At parking lot #1 in the Parker River NWR, we found the sea as calm as we would expect, given the smooth state of the river mouth, as if we were on the shores of a local pond. What a difference two more days would make, with a short but wild nor’easter buffeting us for hours. As has been the case all winter, most of the birds at the beach were far out on the sea. Out there, we could see many dark shapes of scoters, which would resolve to White-winged when they flew, unless they would have to be assumed to be either Black or Surf Scoters. Most of those were certainly Black Scoters, as we could sometimes see the bright orange bills of drakes, and no “skunkheads” could be discerned. 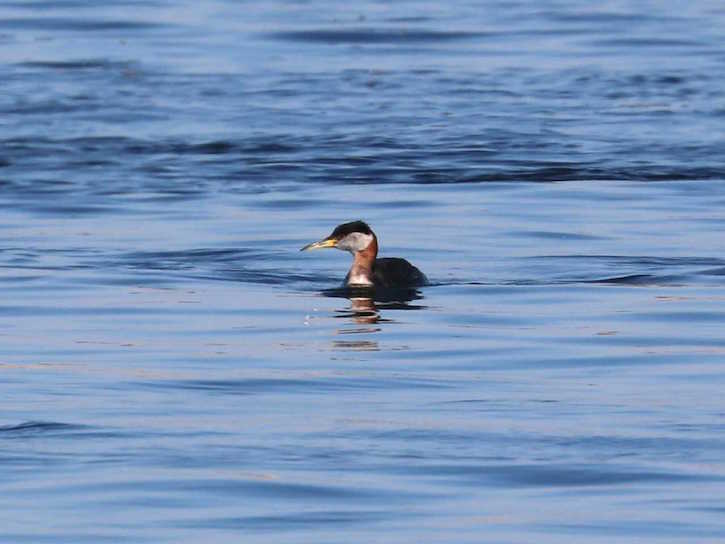 A few Horned Grebes appeared there as they usually do, along with plenty of Common Eiders. A Northern Mockingbird sat in a shrub on the south side of the parking lot, and we expect to see plenty of antics from that bird as spring progresses. 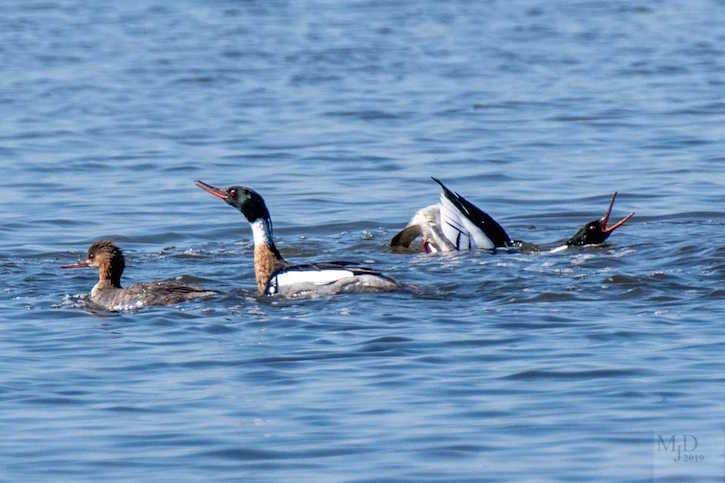 Our next stop was at the Main Panne for this amazing show by a little gang of Red-breasted Mergansers, and to check out the Gadwalls and American Wigeons that have spiced up the population of American black Ducks that is always there. After that marvel, we had used a good bit of our time, so I suggested that we go as far as Hellcat, even though the gate there was open. But people who had gotten wind of the recent sightings of King Eider and Pacific Loon at Emerson Rocks revolted, and we capitulated with a run straight down there. I did notice a dark form on the Pine Island nesting platform as I pushed on by and behind the trees, but others in the rear of the caravan found that to be a dark-morph Rough-legged Hawk. The rocks were covered by the tide by the time we got up to the parking lot #7 dune platform, and the birds that hang out around that pile of rocks were a bit spread out on the nearby sea. Some of us got very fleeting looks at a distant loon that looked a bit different, but that is as far as that went. I can’t figure out where that King Eider went with the rocks unavailable to hide behind, but he was not to be seen then, only to return that afternoon. All over the island we noticed Red-winged Blackbirds dotting the bare-branched trees and shrubs, and a boisterous flock of Common Grackles passed over the gatehouse at one point. With the Killdeer we found here and there, the singing of many birds we enjoyed, and the steeper angle of the light, this was a Vernal Equinox WMB indeed. The time has come when we are being reunited with the beloved creatures of our green-season communities. We hope you can come enjoy them with us! Mute Swan (2) – ads, small pannes. Gadwall (3) – 2 drakes, 1 hen; main panne. American Wigeon (3) – 2 drakes, 1 hen; main panne. Greater Scaup (7) – north end. Common Eider – common; north end, one ocean, seven ocean. 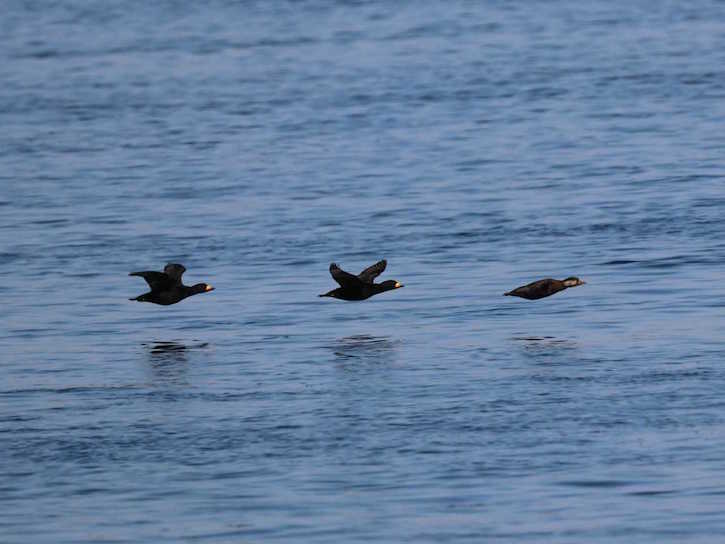 White-winged Scoter – common; north end, one ocean, seven ocean. 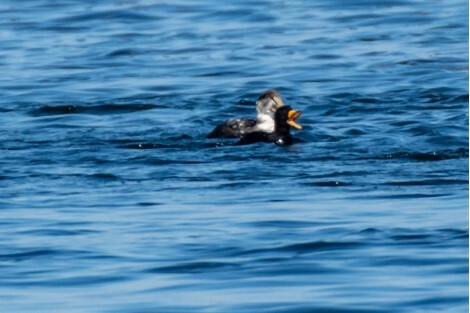 Black Scoter – common; north end, one ocean, seven ocean. Long-tailed Duck – common; north end, one ocean, seven ocean. Common Goldeneye (15) – north end. Red-throated Loon (3) – north end; beginning molt to breeding plumage. Common Loon (2) – 1, north end; 1, seven ocean. Horned Grebe (9) – 3, one ocean; 6, seven ocean. Red-necked Grebe (2) – north end; both molting – breeding plumage evident. Bald Eagle (3) – 2 ads, 1 imm; north end – Salisbury side. Rough-legged Hawk (1) – dark morph; Pines nesting platform. Mourning Dove (2) – north end. American Robin (5) – S- curves. Northern Mockingbird (2) – 1, north end; 1, vicinity parking lot #1. European Starling – a few. Yellow-rumped Warbler (3) – roadside, s. old pines. Red-winged Blackbird (~ 8) – various. Common Grackle (~ 12) – parking lot #1. House Finch (1) – north end. This entry was posted in Birding on March 24, 2019 by David M..